« Another recipe from my fictional world—Auntie Thanike’s spring soup. I think there might be. I’m going to preface this by saying I have no desire to feed the flames of the Star Trek versus Star Wars arguments. I like them both. To be absolutely accurate, I am a passionate Niner, love the original Trek, like Next Generation, and also like the first three Star Wars movies. It’s quite possible to love both Trek and Star Wars. It’s also quite possible to get annoyed by technobabble in both franchises! That said, I think the original Trek did something very clever with dilithium. When I was a kid watching the reruns, I didn’t question dilithium very much, if at all. It was just a substance the Enterprise needed if it was to fly through space. As I’d learned in music, All Cars Eat Gas. All Starships Eat Dilithium. Cool! 1. We’re all familiar with the idea of fueling an engine. 3. Following on from the second point - though I didn’t know it when I first saw the show as a child, lithium’s a highly reactive metal, the first of the alkalis. You’d want something reactive to power a starship. 4. And finally, the show just mentions dilithium, mentions its scarcity and value, and lets it go at that. That’s the really smart thing here. Because, if you start explaining, things get more than a little quirky. 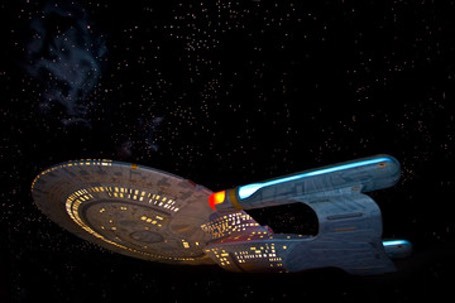 It seems the Enterprise runs on fusion, the same process that powers the sun. The primary fuel for fusion is hydrogen, not lithium, and people who dream of creating fusion reactors on earth expect to use seawater to make electricity. When you think about it, it’s easy to see why Starfleet engineers would prefer not to use seawater! Or, indeed, fresh water. It’s heavy and hard to store. So kudos to the Star Trek creators for coming up with a bit of technobabble that just does its job. Back in the 1970’s, George Lucas did the same thing with the Force. Star Wars was basically a fairy tale set in outer space, with a princess, a farm boy, a black-clad villain, a wise mentor, and so forth. The Force made perfect sense as a power running throughout the universe that some people could access and use. But then they went and wrecked it. 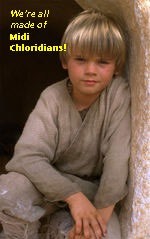 What, please, is the point of midi-chloridians? How are these fantasy mitochondria any better than the Force? Again, the Trek writers were wise not to explain too much when they came up with warp drive and dilithium. Likewise, in Star Wars, the Force was doing its job just fine without any midi-chloridians to explain it away. So here’s a tip: if you have to write technobabble, keep it as simple and as real as you can. And don’t explain too much! As for me, the idea of writing technobabble scares me. I don’t invent science; I try, as far as I’m able, to keep what little science I’ve put in my stories real. But I can enjoy good technobabble when I hear it, or read it. To me, dilithium is good technobabble. The Force is quite decent technobabble. The best technobabble I’ve ever read, though, is in Diane Duane’s Young Wizards. I just love reading her kids using the speech to cast spells! How about you? Do you love technobabble, or hate it, or are you indifferent? Do you think it’s good to explain everything in a science fantasy, or are you willing to let some things go? And what do you think is the best technobabble you’ve read or watched?